Launched in September 2008 by Valley Forge, PA (represent!) based Gabriel Weinberg, DuckDuckGo is a search engine that promises privacy and simplicity. From its playful name to its hallmarks of better instant answers, less spam, and no filter bubbles, Weinberg’s creation has a certain allure to it. Not to mention, the DuckDuckGo extension, DuckDuckHack, allows developers to create open source plugins that add functionality to the search engine. An open source search engine? Pretty cool, right? 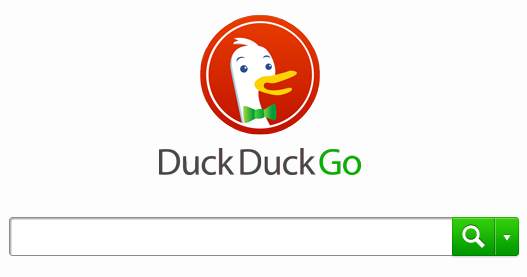 While DuckDuckGo has not the notoriety of the children’s game from whence its name was coaxed (Duck, Duck, Goose! ), it continues to gain traction among techies and the privacy-concerned. I’d expect that it appeals to wealthy Buffalo residents, as well. They can’t get enough of the bills. Ah, yeah, sorry about that. Anyways, let’s get down to business. Here are three features that make DuckDuckGo worth a weeklong try (and perhaps a t-shirt purchase). One of the premier features of DuckDuckGo is its users ability to use !Bang commands to limit their searches to given websites. Want to use the DuckDuckGo search bar to query Amazon for the highly acclaimed Tuscan Milk? No problem. Simply include ‘!a’ in your search, and you’ll be well on your way to sampling Italy’s most lucrative lactose. Other !Bang commands include: !g for Google, !b for Bing, !w for Wikipedia, !yt for YouTube, etc. The list goes on and on. I referenced the whole open source plugin thing in the beginning of this post, and I think it’s worth revisiting. Making part of a project open source allows outside developers (maybe even you!) to contribute code and add functionality to the live product. Looking for a way to really impact search results that thousands of users see every day? Developing a DuckDuckGo plugin may be in your future! Pretty cool, huh? You may liken these plugins to Google’s Search Features; however, the open source nature of DuckDuckGo (coupled with its enthusiastic community of developers) spells endless possibilities. I’m looking forward to monitoring the DuckDuckGo forums for new plugin releases as the search engine’s popularity grows. DDG succeeds in offering users simplicity in both design and experience. A clean home page; well-designed logo; single, scrollable results page; and a largely ad-free interface make the search engine a comfortable place from which to query the expansive web. While advertisements are used as a source of revenue (syndicated through Microsoft adCenter), they appear rather infrequently, and only one at a time. DuckDuckGo allows you to personalize your experience, as well – granting you control over privacy, color palette, look and feel, and layout. Almost everything is customizable. While I actually like the inherent design, you might find it fun and/or interesting to toggle the controls. With a high degree of sincerity, I can promise you that I’ve left most of the cool stuff to your exploration and discovery. As is true with most search engines, there is plenty to learn and love about DuckDuckGo. I encourage you to do so. Take a day – at work, on the weekend, or at work on the weekend (but not at home on a weekday) – and give it a try. Set it as your default search engine in Chrome, and get DuckDuckGoing. You might like it. You might not. Either way, it’s worth a day’s effort of acclimation. Honestly, who doesn’t like zero-click information about their favorite Pokemon (from childhood)? DuckDuckGo rankings got you down? Have a gander at LunaMetrics’ SEO consulting services. Afterwards, check out more cool DuckDuckGo Goodies!